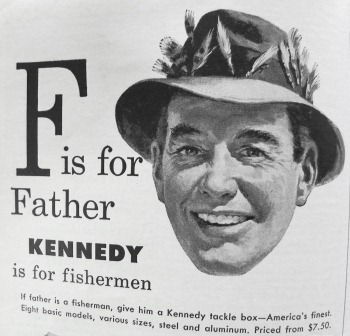 Flashback Friday Double Haul: Who’s Your Daddy? A tree fell last week (see “If a Tree Falls …”) and I showed that I can still stick a saw with the best of them. Ken G (from Waterdog Journal) wondered what it is about men that makes them continue an action, even when they can clearly see it’s not a good idea. 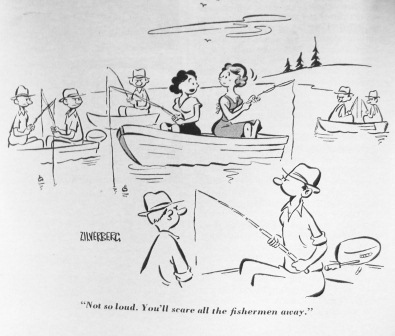 Mike (from Mike’s Gone Fishin’ … Again) could relate and expressed his love of power equipment. 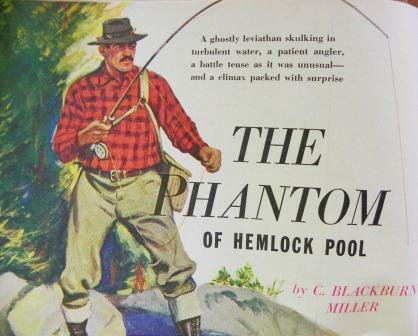 Paul Cowell (from Paul’s Angling Journal) reminded me to keep plenty of gas in the saw, in case of zombies, and my post began take on a rather masculine air — at least until a comment appeared from a girl. Girls who like chainsaws are okay by me, especially when they also fish and can write like Erin Block does on her blog Mysteries Internal. She has a way with words I … I … well, you know. After you’re done with this you really ought to go read her piece “The Dancing Cast“. I am not surprised when I see a woman with a chainsaw but there was a time when such a thing was unheard of. 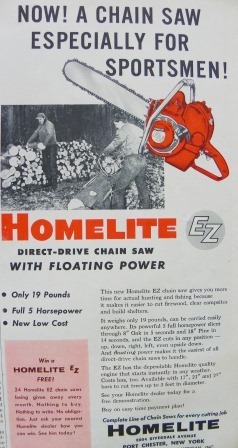 Homelite started marketing their saws to sportsmen, back in the days when clearing campsites and building log shelters were still acceptable practices. Even at only 19 pounds, I can’t imagine wanting to lug a chainsaw along on a camping trip, unless I was heading into zombie habitat, and I’m not so sure that anyone — man or woman — would actually look forward to running the thing. That was more than half a century ago. Women didn’t run chainsaws. That was work for a man. An outdoors man. The kind of man girls really go for. If she behaved herself, the little lady might get invited along on a fishing trip some day and when she did, it would be with her very own proper, pink, lady-like equipment. Of course no woman should ever be expected to touch a worm, but don’t worry, thanks to Worm-O-Rama the little lady didn’t have to. How about that? Now go make us some sandwiches because this is He Man Country. A magical place where all the fish are large and noble and good but you’d better hurry and get some yourself before they’re all gone. A place where the six inch brook trout caught by Melvin from Accounting on Saturday transforms by Monday into something all together different. He Man Country, where we don’t need no apps on our phones to tell us where we’re going and, no, we’re not going to stop and ask! 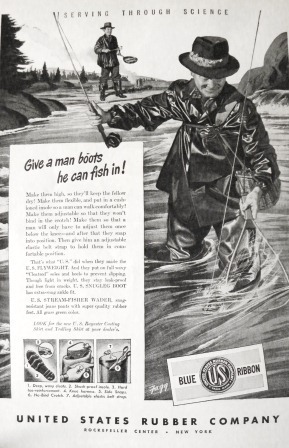 Manly men doing manly things had certain expectations of their gear, even as yet another breakfast was in danger of being dropped into the water. But we all know that, in spite of all the bluster and posturing, those men had vulnerabilities. 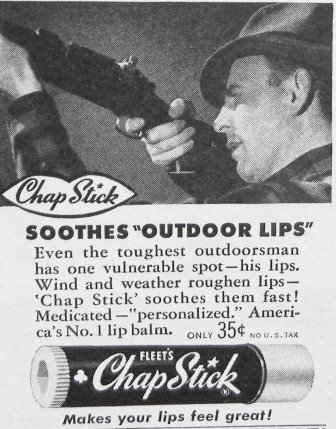 Judging by the frequency with which certain ads appeared, way back when, a man’s lips were not all he had to worry about. 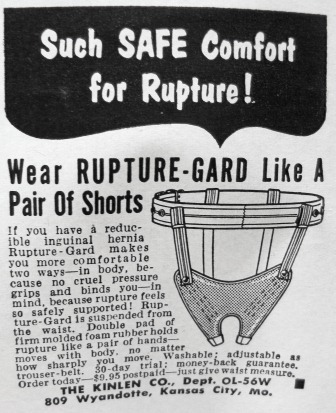 Among weekend warriors, reducible inguinal hernias were evidently common, also known as “ruptures”. Even the toughest customer found himself eventually slowing down in more ways than one. 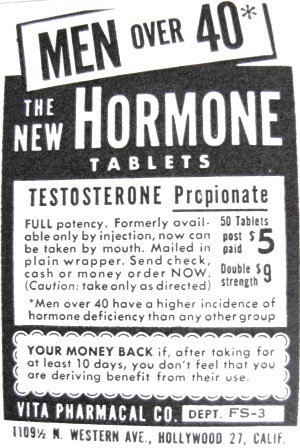 With very little television, and no internet at all, men found help where they should have — in the back of magazines. Discreet, safe and easy. 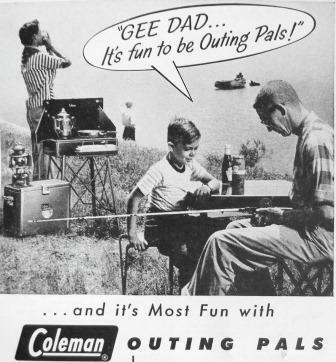 Sooner or later, even the most masculine fellow found himself spending less time living out his outdoor fantasies and turned his attention to more important things like family, passing along his passion to the next generation. 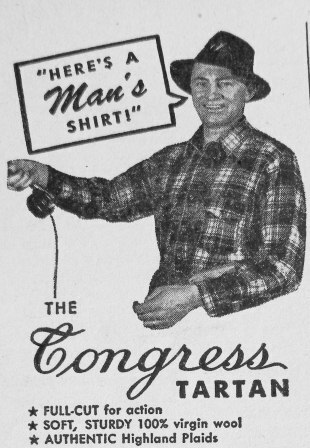 With his high-flying adventure days behind him, a man could still look the part, though, with a brand new shirt on Father’s Day. “FULL-CUT for action” and maybe covering up that truss? 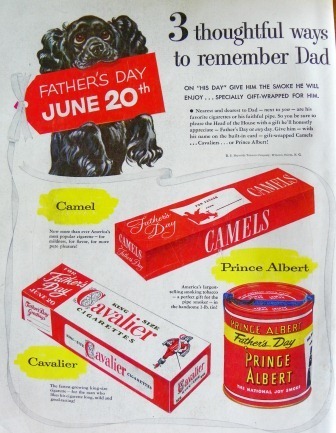 And what father wouldn’t appreciate one of these wholesome gifts? Kind of makes you miss the old days, doesn’t it? I’ve seen things like that rupture gard in the backs of magazines before. But I don’t recall them being Outdoors magazines. I remember my mom finding that magazine, exclaiming “that’s disgusting” and tossing it in the garbage. Which is where I had found it to begin with. Men, men, men, men . . .
As my wife reminds me whenever we need to drop a tree, she majored in forestry. Sad to say she can hit her mark every time…out-fishes me as well. Oh and by the way, both Erin and my wife look better in flannel than I ever will.